The beautiful Thainstone House Hotel, Inverurie, played host to our latest team building events: Bush Tucker. A group of around 40 budding out-backers battled it out head to head throughout the afternoon for a chance to get their hands on the magnificent Team Challenge Company winners trophy. 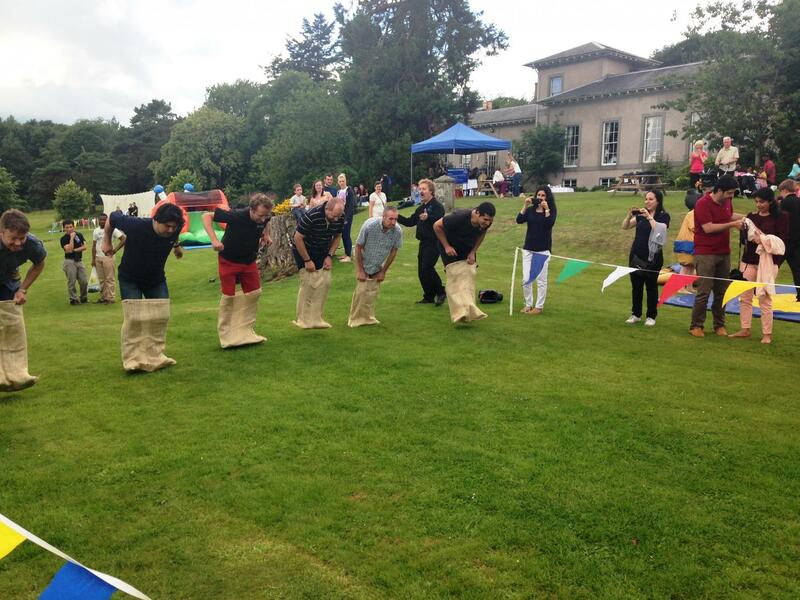 This would be no easy task however as the Technip jungle jims had to man-oeuvre their way through a series of tasks, activities and challenges to be crowned as our winners. First up was Oz or Out where the teams had to decide if a certain place name was genuinely an Australian place or not. This difficult but fun opener cleared a lot of people early doors as the likes of 'Yorkeys Handle' and 'Jim & Billy' threw people off. Round after round the teams laughed hysterically at some of the Australian names popping up on screen. Connor eventually ran out a clear winner by beating Novie in the final In front of a baying crowd. The second round involved our dinner disaster where each team had to eat a dried cricket. Yum! Team eclipse and the jungle jocks went head to head and they both washed it down a treat. Easy they said! It was about to get much harder. The quest for stars brought them to safari surprise where teams had to rummage in concealed boxes for stars for their team. The Brazilians and the rat pack got stuck right in and went for glory. Wendy got so caught up in the moment she managed to leave her star on the table behind her. Vicky was also right in there. Elbow deep. And to the crowds pleasure coming away with a star. The desert penguins and the jungle jocks made up the front runners as the teams entered a quiz round to guess who was in the jungle. Snaps of Joey Essex, Shaun Ryder and Amy Fullerton tricked a few people along the way but each team showed their intent by posting a marvelous score. The jungle jocks climbing for the tree tops while while team eclipse and theory pack were left bewildered on the jungle floor. Another challenge saw Connor blast through some crickets, Bethany took on the massive rhino beetle and Derek took on some ants. All overcoming the fear of eating the creepy crawleys and keeping their respective teams trophy hopes alive. Outback fling was a tight affair with the do-gooders doing not so good with a big fat 0! The desert penguins romped home in this one with a 3 boomerang haul! After more safari surprise antics and Natalia doing her best to lose all her expensive jewellery in the slurry and sludge the stars were all recovered safely and in a double bonus round as well. Each team were eying victory as we headed for the break. The action kicked off again with the return of the build your own bush tucker hat. Where teams were rewarded for how fashionable and practical their hat would be in a jungle situation. The jungle jocks modeled a Vivienne Westwood style hat on big Roy who wore it with style and panache. It also had a chin strap as he pointed out on more than one occasion. The crazy hat designs came and went with each team modelling their designs with such outlook and enthusiasm. The desert penguins finally won the acclaim with a waterproof, bug proof and sun repellant design. Great stuff. The bush tucker bar awaited our 6 team members as we hit the home straight. A concoction of water, custard, beetles, scorpions, meal worms, ants and silkworms made up this lethal shot glass of pure jungle hell! The prize on offer was two stars to the man who could finish it first! After swigging back the cocktail and a few gut wrenches it was Ian who sunk his outback jack in the quickest time. A badly needed two stars for team eclipse. After all was said and done and after a thrilling day the stars were counted and verified. This popped the jocks and the desert penguins head to head in the gross out finale. A water treading locust, five inches long and two inches wide would earn either team the win in a hotly contested final. The lucky ones were Connor and Gems. Both gave it their all and chewed frantically but as Connor winced Gems blew him away with a convincing chew and swallow of the entire beast. An unbelievable end to a fantastic day. The penguins ahead on stars until the very last gasp as Gems snatched victory from the jaws of defeat. The jungle jocks worthy and undisputed kings and queens of the jungle taking home the Team Challenge Company Trophy. 2nd place was if course desert penguins who were quashed at the final hour. The Brazilians put in a handy performance and came in third. Team eclipse fourth with the do-gooders in fifth. The recipients of the wooden spoon today were the rat pack who never really made it out of the jungle gutter! Well done to everyone who got stuck into the challenges today. A memorable day with some fantastic people.